Installing a teleconference system is a complex, costly, and time-consuming venture for any enterprise. Presentia, a new venture from Joseph “Joey” G. D'Angelo, vice president at Charles M. Salter Associates, and Steve Garber, president/CEO of BP Marketing Group and HD Distributing, proposes to streamline that process with a pre-configured, all-in-one solution dubbed PresenTable. 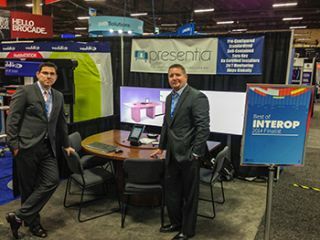 Joey D'Angelo and Steve Garber with PresenTable, Presentia's all-in-one teleconferencing solution. D’Angelo, an AV consultant for 16 years and over 450 projects, has worked on more than a few conference rooms during his career. It takes numerous people to design a teleconference system, source the AV components and furniture, and integrate and test the equipment, he observed. That process also introduces many variables. “It makes it so that almost every room you do is a one-off, and makes it impossible for enterprise-level clients with offices all over the world to standardize globally,” said D’Angelo. Add into that the construction work to modify the room and the Presentia package could shave tens of thousands of dollars off such a system, he said. Taking as a template the architecture used on his Juniper Networks project, the world’s first large-scale deployment of fully networked AV systems, D’Angelo devised an integrated package of pre-configured and tested AV components and furniture. “You put it together like a piece of Ikea furniture, plug in one power cord and one network cord, and you’re done,” he said. The product is available in four standardized systems: SemiPresence, a semi-circular table with a pair of 55-inch HD LED displays with HD camera and built-in table mics; PresenTable 12, incorporating a 90-inch HD display and seating 12; PresenTable 8, seating eight, with a 65-inch screen and a tabletop teleconferencer; and PresenTable 6, accommodating six in front of a 55-inch screen. SemiPresence is a semi-circular table with a pair of 55-inch HD LED displays with HD camera and built-in table mics. Plus, noted Garber, the turnkey package affords new opportunities to solution providers. “There are a lot of telephony integrators and office furniture integrators that are dabbling in AV but have no idea how to get into this,” said Garber. “But they have the relationships, so we hope that this gives them a fighting chance to grow their AV side.” Presentia hopes to address some of that business with a presence at NeoCon, the country’s largest contract furniture show, prior to InfoComm.